Cindy McCain said she has been trying to get into Georgia since the conflict started, but it took time to arrange the logistics. Her husband, she said, is "very supportive. As soon as he saw what was happening  he and I, we connect on many levels. I mean, he knew immediately [that I would want to go]. I've been to Georgia with him; I know the country." 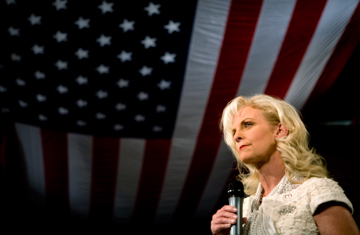 As she prepared to leave, Cindy McCain spoke of her concern about the situation there. "There's a very serious land-mine issue now because there are land mines being laid as we speak," she said. "There's a whole bunch of things going on right now, and as we begin to move refugees from Point A to Point B or try to feed refugees who are stuck in pockets around the country, we're running into the issue of the blowing up of humanitarian vehicles that are trying to get to the refugees. So it's a whole morass of problems now." McCain's first exposure to the issue of land mines was after the first Gulf War, when she traveled to Kuwait with the medical group she had established in 1989, American Voluntary Medical Team. "We went basically as an emergency team, not knowing what we'd be getting into," she recalled. "We discovered, as did the Kuwaitis, that the Iraqis had planted land mines in the playgrounds. So we hadn't been there 12 hours, and the first case we get is a young child who had gone outside to play on the teeter-totter and stepped on a land mine. That was my first experience with land mines." She has heard similar reports of injuries to civilians and refugees in Georgia, which she hopes to investigate. "When people begin to run, they run for places that they know are safe  schools, churches, community centers  and those are the first things that are mined," she said. She has slipped away from the campaign trail frequently this year: in March, McCain visited Kosovo with HALO to assess progress in clearing minefields there. In June, she was in Vietnam, Thailand and Cambodia, working with Operation Smile, the charity that helps disfigured children and on whose board she also serves. In July, she was in Rwanda, reviewing relief efforts by the World Food Programme. She plans to return to the U.S. from Georgia late Wednesday. "It's a very quick trip," she says.